It’s Christmastime, that part of the year I’m eagerly waiting for, because now I have a reason to bake a lot. Over the year I keep bookmarking recipes under the category “Christmas”, usually big batch cookies, so that I can bake it and share with friends, neighbors and others in the community. This year I’m a bit late though. So far I have baked only this big batch oatmeal raisin cookies and I don’t know if I have enough time to make a cookie assortment platter. I have been getting requests for gingerbread man cookies and other things. I really wish I can get to it. 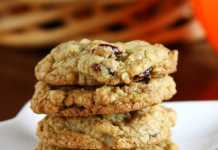 This cookie recipe is a mix of two recipes; my earlier recipe for big batch chocolate chip cookies and this big batch oatmeal raisin cookies. My son’s Hindi class friends were having a “end of the year” party and his school “winter break” party was also coming up, so I wanted to bake a big batch. These two parties were a week apart, so I decided to freeze about 2 dozen cookies for the latter one. 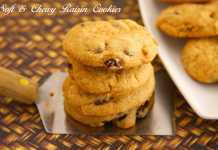 See my notes to know how you can freeze the dough and bake fresh cookies just when you want it. I made it nut free (and of course egg-free too) because of the nut allergies, but would definitely suggest adding nuts if you can. At first I wanted to make it just oatmeal-raisin, but you can’t go wrong with chocolate chips with the kids, so decided to go for it. This cookie recipe has room for a lot of changes. If I had M&M’s (Smarties/Gems) with me, I would have added that instead of the chocolate chips. You could also get just the red and green M&M’s and make it all Christmassy! With this big batch oatmeal raisin cookies you can feed an army. This is your go-to recipe when you have a pot luck or a cookie swap. This is also the answer if you want homemade cookies all the time. Just freeze the dough and have homemade cookies anytime you want. Preheat the oven at 350F/180C for 15 minutes. Lightly grease baking sheets or line with parchment paper and set aside. Blend the egg replacer powder and 1/2 cup luke warm water until it’s frothy. In a medium size bowl, mix together the oats, flour, salt, cinnamon and baking soda. In a large bowl (you need a very big one), cream together the melted butter and sugars using a hand held electric mixer, until it’s light and smooth. This may take up to 7-8 minutes. Add the frothy egg replacer mixture, vanilla extract and 1/4 cup water to the creamed butter and beat it for another 2-3 minutes. Stir in the dry flour mix in small additions to the wet mixture and combine it using a wooden spoon or spatula. 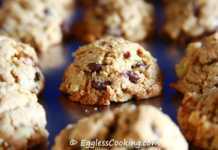 Once the dry and wet ingredients are incorporated well, stir in the raisins, chocolate chips and coconut. Combining it all becomes quite difficult at this point, so transfer half the dough to another bowl and mix them well separately in each bowl and then combine it again and mix it well. The cookie dough is very thick and stiff. Scoop out a tablespoonful of dough for each cookie and drop it on the baking sheet. Lightly flatten it with your fingers or using a fork. Bake for about 12-14 minutes or until the bottoms turns golden brown. I baked mine for 13 minutes. Remove the cookie sheet from the oven and place it on a wire cooling rack for 5-6 minutes, where it still continues to cook. After 5 minutes, remove the cookies from the pan and cool it completely on another wire rack before storing it in air tight containers. These oatmeal raisin cookies turned out terrific. It got me so much appreciation from everybody (children and adults as well) who tried it. These cookies were very crispy on the day it was baked but became soft from the next day on. I liked both the textures. It was a bit sweeter than what I usually bake but I baked these to give it to my friends and my son’s friends, so it was okay. Chopped walnuts would have been a very good additon to these cookies but I didn’t use it because I was baking it for my son’s class, so wanted it to be nut free. So if you can eat nuts definitely add it. For the oats, I used a combination of the big size rolled oats and the usual quick cooking oats; 3 cups each. This gave a nice crunchy texture and look to the cookies. 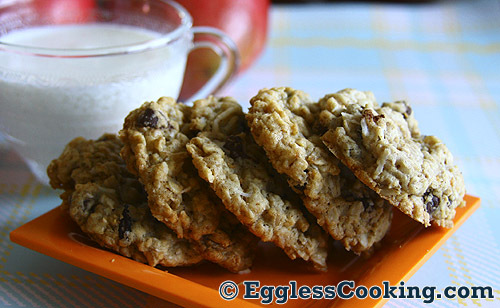 Add about 2 cups of chopped walnuts to make these oatmeal raisin cookies even more special. A combination of raisins and dried cranberries will also be nice. The flaked coconut gave these cookies a very good texture and taste, so I will definitely suggest adding it. Also oatmeal and coconut is a very good combination. Do try it and you will be glad that you did. These cookies don’t spread much, so I would suggest flattening them a little bit. This cookie dough also freezes well. I froze little more than 2 dozen cookies, by scooping out the dough, putting it on a baking sheet and freezing it with the pan. Then after about 3 hours, I removed the frozen dough pieces and saved it in freezer bag, sealing it air tight. Now these cookies can go to the oven straight from the freezer. You just have to bake a couple minutes more, maybe 2-3 minutes. Love your site and have made a few cakes. They turned out very well. I have a question. Here in India, it is difficult to get unsalted butter. (you get them during christmas)..so what is the alternative while making these cookies. Also any alternative to the egg replacer? Thanks for your feedback Chand. If you are using salted butter then omit the salt in the recipe and you should be fine. Even though I have not tried this personally, that’s what I have read. Right now I don’t have an exact substitute for Ener-G egg replacer, but I’ll surely share a recipe if I find something good. Thank you Madhuram on the Vadai feedback. I am glad you liked it. How is the New Year so far? Cookies look great! I made the fruit cake but my daughter made chocolate chip cookies with some help from me and I must say she put me to shame. I am yet to put my oven to use. I use it mainly to ferment the batter and to set yogurt. Wow huge batch of cookies. Perfect looking cookies; Feel like munching some. Hi Madhu, We are doing good. We moved from Phoenixville to KOP and one good news, we have one more addition to our family now. She is Sanvi 5 months now. So Akku is so happy. How’s Arjun? Hugs to him Awesome cookies as usual. Merry Christmas and happy holidays. Wow…thats a huge batch of cookies, perfect for gift giving. And they look fabulous, love the ingredients!